Groupe Magma believes a part of the island of Montreal known mainly for its oil refineries could become a new hotspot for condominiums. Montreal-Est “is the next El Dorado of development,” says Yan Le Houillier, president of the development division of Groupe Magma, which has developed more than 700 condominium units in the Montreal area. The company is currently developing Le M Montreal Est in the community of 3,800, a $35-million, seven-storey building with 93 units. The project is built directly on the waterfront of the St. Lawrence River and facing a park. Construction began in July and the building is slated for completion next summer. About 50 per cent of the units have been sold. Le Houillier says he was initially reluctant to respond to a call for tender from Montreal-Est for the sale of two lots on which the property is being built. But since the site was on the riverfront, Le Houillier decided to pay it a visit. “It was the complete opposite of the vision I had of Montreal-Est. It’s not close to the refineries, there’s a park, city hall, the river. I really fell in love with the site” and decided to make an offer. The site was once home to a long abandoned church that did not have historical value and was demolished by the city. In its place, the city wanted a high-quality project that would be part of its rebuilding efforts. He notes the majority of the refineries have shut down and been decontaminated. In addition, Montreal-Est’s community centre has been renovated and the main artery, Broadway, which is adjacent to Le M Montreal-Est, is slated for a makeover. “The area is ripe for change and the city has a plan to completely revitalize it,” Le Houillier said. 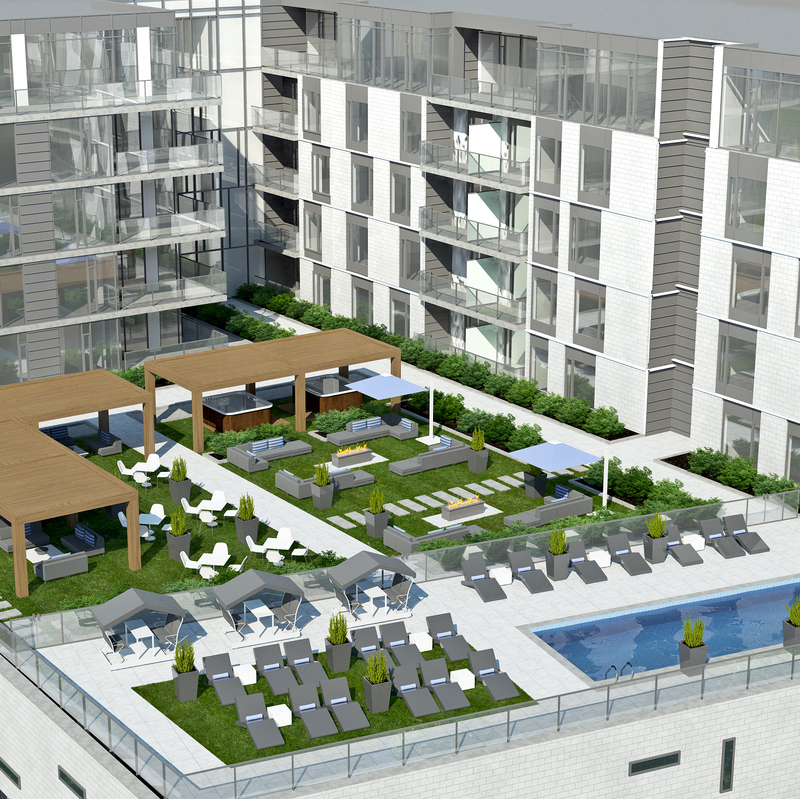 Le M Montreal-Est will have one-, two- and three-bedroom units and penthouses ranging from 755 to 3,090 square feet. Prices range from $204,900 to $690,000 (taxes, garage and storage included). A three-bedroom unit with 1,615 square feet goes for $390,000 inclusive. Prices are much less expensive than elsewhere on the island – about $275 a square foot compared with $400 to $700 a square foot in popular Griffintown near downtown. “Montreal-Est is the next step in development because it’s becoming more difficult to find affordable land in the centre of the island,” Le Houillier says. The building will feature ground-floor retail – Groupe Magma is in discussion with restaurants, cafes and grocery chains – and parking will be primarily on the second floor. Housing units start on the third floor. There is no underground space, which eliminates water management issues, given the proximity of the river. The first two floors have a 40,000-square-foot footprint while housing levels have 25,000 square feet. That’s freeing up 15,000 square feet on the third floor for “a super large” terrace (or patio) that will face the river and features an in-ground pool, spa, fireplace, pergolas, relaxation areas, changing rooms and bathrooms. There will also be a common room with full kitchen for receptions, VIP room on the seventh floor for penthouse owners, training room and billiards lounge. The housing units feature central heating and air conditioning, engineered wood and ceramic floors and kitchens with quartz countertops. Two- and three-bedroom units have two full bathrooms. Real estate development is a relatively new specialty for Groupe Magma, which launched in 1999 building reinforced concrete structures for major developers in Montreal. That division continues today. Two years ago, the 175-employee-company launched a concrete resurfacing division which repairs buildings, underground garages and balconies built in the 1950s and 1960s. The real estate development division began in 2006 and condominiums have been built off the island of Montreal in Mascouche, Terrebonne, Laval, Lorraine and St. Lambert and in Montreal in Griffintown. In Griffintown, the company has built Carre de la Montagne which contains 148 units and ground-level stores. This fall it is completing Brickfields, a 15-storey development that combines 32 condo units with retail and office space. The M in Le M Montreal-Est stands for Magma and has also been used for the 98-unit Le M Lorraine. “It’s the new signature for our projects, our trademark,” Le Houillier says.